Austal's latest frigate design proposal for the U.S. Navy FFG(X) requirement. 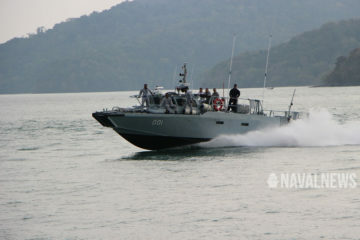 Naval News picture. The two major modifications consist in a longer hull (456 feet / 139 meters compared to 418 feet / 127 meters for the earlier design) and a CODAD propulsion system with controlable picth propellers (CPP). 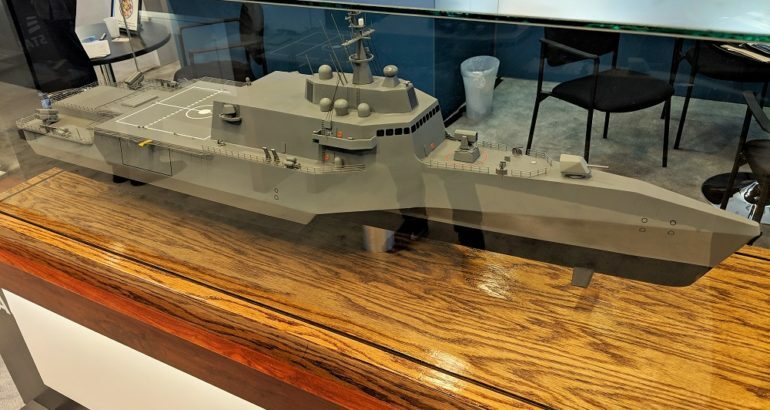 Earlier Austal Frigate designs featured a similar hull form to the Independence-class LCS as well as its waterjet/gaz turbine propulsion arrangement. Austal’s latest frigate design proposal for the U.S. Navy FFG(X) requirement. 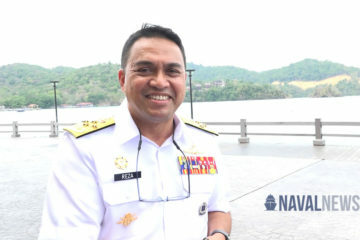 Naval News picture. 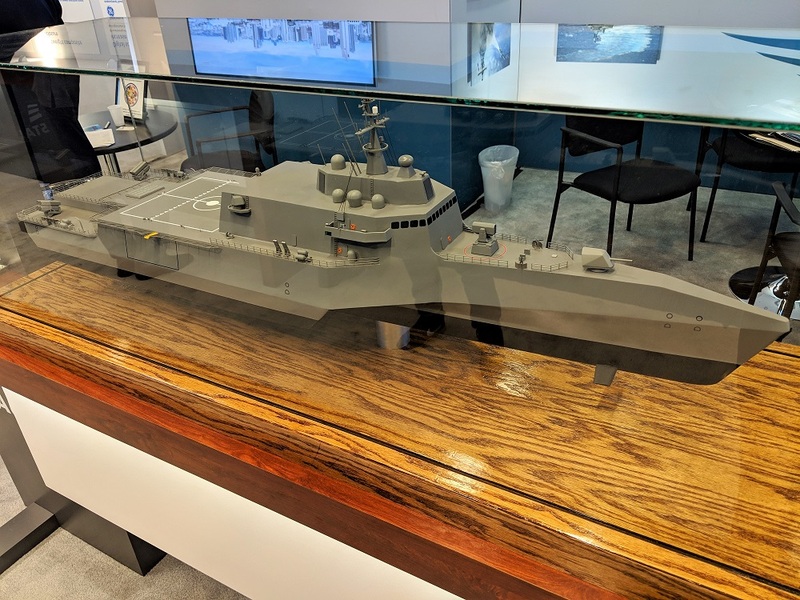 Talking to Naval News at SNA 2019, Tim P. McCue explained that the Austal Frigate in this configuration “probably meets 90% of the U.S. Navy requirements”. He further explained that the reason for the stretched hull was to accommodate the new 32x VLS requirement (previous designs featured 16 silos) while the change in the propulsion system was to better match the speed requirement of “only” 26 knots. For the same reason, the Austal Frigate doesn’t feature a bulbous bow anymore (compared to the LCS hull form). Austal will soon be conducting some tank tests of the new hull form to validate its characteristics and performance. 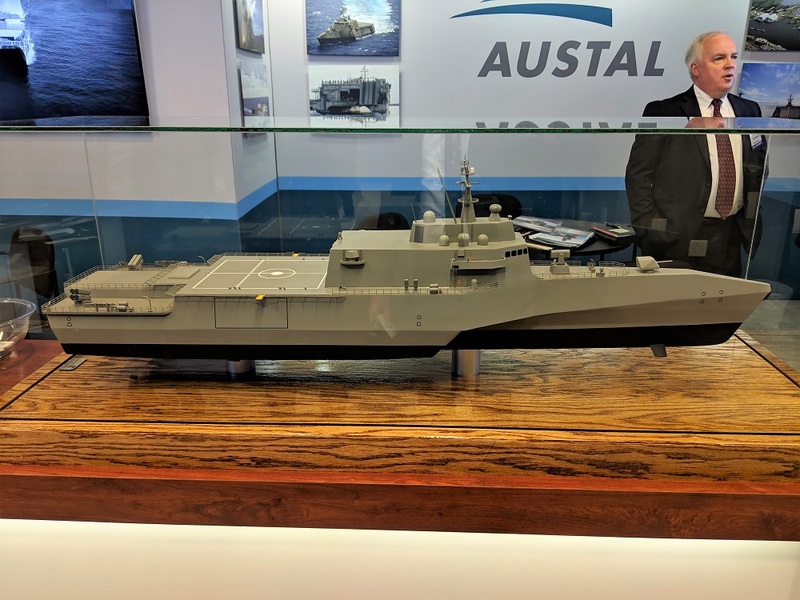 As they further tweak the design, Austal might be able to shorten the hull length back. 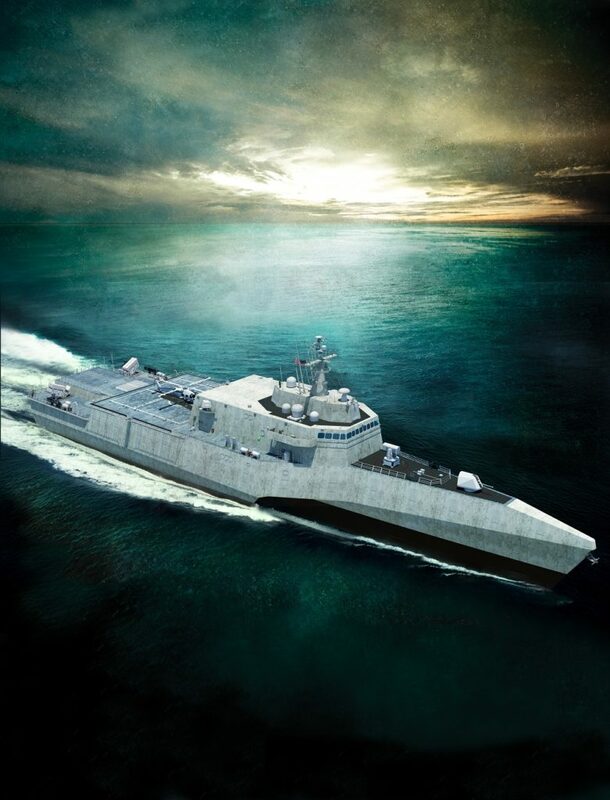 According to Austal, the Austal Frigate provides the capabilities and agility necessary to deter or engage and defeat adversaries in today’s environment. 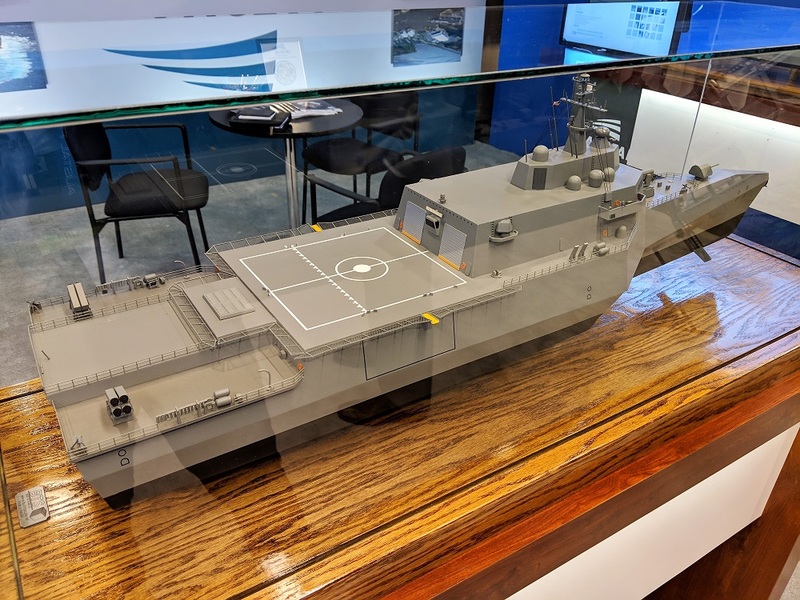 Based on a proven U.S. Navy parent design, the Austal Frigate restores the military advantages necessary to preserve peace trough strength or prevail in conflict with the United States’ strategic competitors. The Austal Frigate is designed to readily adapt to the increasingly complex global security environment, rapid technological advancements, and the changing character of war. I am guessing 456 feet is the longest you can build spilling out of the assembly building without hanging over the water or the road at the shipyard. It will be very interesting to see how they plan to squeeze 2 convention props and rudders onto that skinny center hull. I think the Navy will return to a steel hull for the FFG(X) for its superior survival aspects. 50 knot aluminium hulls should not be considered. ruling out the 2 LCS designs.